Please excuse this particularly scruffy part of the garden, it was the only large enough flat bit of lawn I could find! I used this tutorial (in 2 parts), but modified the assembly of the cover as I was using an upholstery weight fabric rather than sheeting. I hemmed the panels BEFORE joining them together, then closed the bottom end of the pole casings individually once the cover was assembled. The hardest part of the whole operation was inserting the poles into the cover, it felt like trying to dress an uncooperative octopus! I am usually at work on a Saturday but due to a bit of shift swapping this week I found myself with a few free hours this morning... time to tackle a bit of heavy-duty sewing! The task: to sew a new mattress cover for Daisy's bed. The previous incarnation was a colourful patchwork affair, but I decided to go for something a bit more utilitarian this time around for my senior doggy (14). I ordered some waterproof 600 denier polyester canvas, appropriate thread and velcro from here. So, with pieces cut and the machine armed with a size 16 jeans needle I set to work... it was a bit awkward wrangling such stiff fabric but I got the job done! Don't worry, I put her quilt back in the bed after my little photo shoot! I am on a roll so far this quarter, that's the second finish from my Q2 FAL list :) I wonder if this productivity will continue?! Some mini napkins for packed lunches (they are about 20cm square). I cut ten inch squares and finished the edges with mitred corners following the guidelines in this tutorial but using the shortcuts descibed here. I am quite pleased with how they came out! Next up is this non-slip mat for my sewing machine made following this tutorial (I chose to hand stitch the binding to the front). This finished at about 10.5 x 23 inches and made good use of a discarded 16-patch block and some co-ordinating scraps. Finally, I have been doing a bit of cross-stitching recently (of which more another time) and have found myself in need of something a bit better than a plastic sandwich bag (current solution!) to keep my scissors and needles handy. Enter the pixie basket! Cute, isn't it? I actually followed the instructions for this exactly (that doesn't happen often!) the only difference is that I only had 1 inch wide twill tape on hand, so my tabs are a bit chunkier than they are supposed to be. Linking up with quarter 3 finish-along when the time comes! So quarter two was as predicted with 2 finishes and 2 roll overs. My list is a bit longer this time around as I have been a bit distracted by new ideas and have several barely started projects. Kingfisher tapestry (for mum). I have progressed slightly on this, but haven't taken a new photo. I am going to try to do a few stitches each and every day in the hope that it will eventually be DONE! Duvet cover for Daisy (the dog). Currently a bunch of nine-patches. Dresden quilt. I bought a new ruler and this happened. I have a plan, I think it's going to be great! Artisan Apron, made as a bit of a dressmaking warm-up before tackling the above project, it is in need of a serious bit of embellishment before I can properly call it finished! A couple of things I have been meaning to do for ages. Firstly a new peg bag for myself. Following peg bag mania a while back (three years ago, really?) I had intended to make one for me, but by the time I had fulfilled all the requests generated by the prototype for mum I was ready to move on! It was made by me probably at least 12-13 years ago, in a make-it-up-as-you-go-along kind of fashion using what I had to hand (left over fabric and dowelling from cutting down a roman blind, as it happens!) and as such it turned out a bit on the small side. I have had this Clarke and Clarke print (Bird Trail) stashed away since I made that last batch of peg bags. The lining is a mystery red cotton sateen which I have no recollection of buying, but which seemed to be just right for the job. Amazingly I managed to find the pattern that I drew up 3 years ago and just made it in the same way, although I didn't bother with the rickrack trim this time. This is a better shot of the design. I'm liking the way it ties in my blue chair cushions to the cream and terracotta of the kitchen too! I wonder how many more years we can get out of the table? 16 and counting... probably quite good going for Ikea! My first quiltalong finally finished! 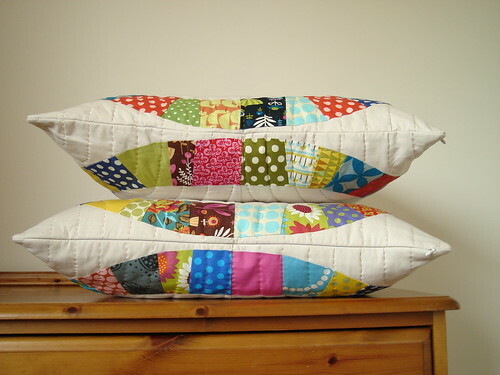 Two lovely big fat cushions! 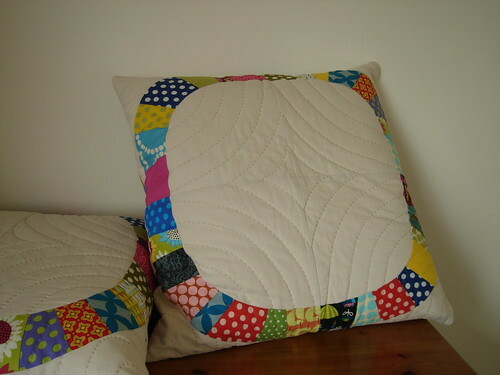 I really enjoyed hand quilting these (I had wanted to give it a try, but honestly did not expect to enjoy it!). I finished them with concealed zips in the side seams and squished 24" cushion pads inside to make them nice and plump. I finished them on friday and they have already been used, napped on and generally enjoyed. More stuff for the dog!